HELP URGENT "ENTRY POINT NOT FOUND." First of all, I tried searching the forum and I found posts related to my problem but they're using Pirated games, I bought the game yesterday and I downloaded it through the night. I've been playing for 25 hours straight, mostly doing stupid stuff with mods and not really with the story etc. Now I have a trainer mod which was really fun, but my friends wanted to play Online so I went but it says I have a modified game version so I downloaded @Gang1111 's GTA V Mod Remove Tool and I am stupid so I just assumed that it wouldn't delete anything important to the game, so I just pressed "Delete ALL MODS from GTA V folder" but after that my game wouldn't even run anymore. I tried running it through steam but it would just say "Running" for a few seconds then it'd disappear. I tried running it directly and that's where I discovered that I am missing steam_api files which I copied from my friend and I retried to run it again but it wouldn't work anymore. So I thought maybe because it's my friend's file? 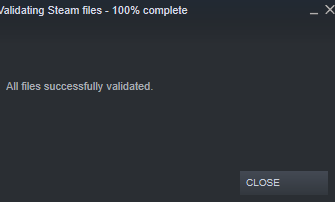 So I tried to verify integrity of my game files but it says that it's only verifying 1 file? 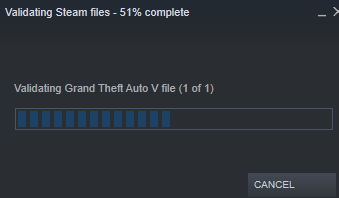 When there's supposed to be 80 gig of files? And even then, it still wouldn't run. Same story. So I tried to manually run it again, now it's telling me the Error. I tried to move files in and out and verifying it to make it work maybe but it still only verifies 1 file no matter what and it's annoying me. I just got a decent computer to play games, I really wanted to play this since its first release, please help.